Although scientists appreciate zircon for its timelessness, it is generally misunderstood and undervalued in the jewelry trade. 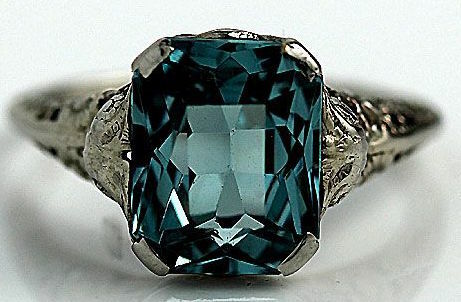 Although it comes in a variety of colors and sparkles like diamonds, most consumers confuse it with an unappealing synthetic gemstone called cubic zirconia. 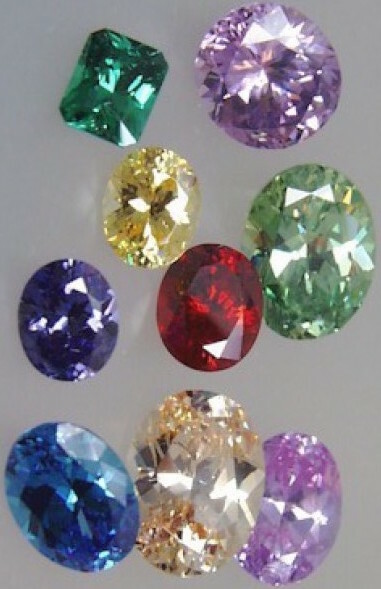 Natural zircon is usually brownish-yellow to brownish-red, but heat-treated gems come in a wide range of colors, including yellow, red, orange, green, purple, and blue. Researchers value zircon because it is the oldest mineral on our planet. Earth’s oldest rocks date back about 4 billion years, but zircons from the Jack Hills in Western Australia have been determined to be 4.35 to 4.4 billion years old. This means that Earth existed only about 150 million years before the first zircon was created! How do we know? Scientists now believe that the Earth began to cool soon after it was formed. This cooling process created igneous rocks in which tiny zircon crystals were also formed. Although the host rocks have now disappeared through multiple rounds of erosion and deposition in what we call the Rock Cycle, the tiny zircon crystals once contained in those rocks have managed to persist. By studying these ancient crystals–often less than a human hair in width–scientists have learned some startling things about our planet. 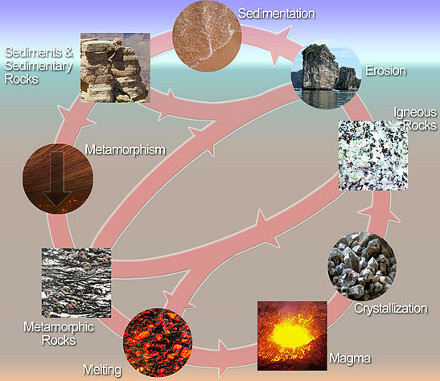 The Rock Cycle describes the transformation in geologic time of the three main rock groups: igneous, sedimentary, and metamorphic. Although zircon is resistant to heat, pressure, erosion, and corrosion, the life of an ancient zircon crystal undergoing multiple rounds of the rock cycle has, no doubt, been a rough one. As a result, ancient zircon crystals develop zones or layers of different composition and age. In some cases, the outer layers of the crystal may be affected while the core survives virtually unscathed. These features makes zircon an excellent tool for investigating the history and evolution of our planet. Radiometric dating is a technique used to date materials containing trace radioactive impurities. 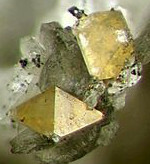 Zircon contains trace quantities of uranium and thorium. Both uranium and thorium are radioactive elements with known half-lives. This means these elements decay to lead (Pb) at a known rate. If scientists find lead in zircon, they know it was produced by the radioactive decay of uranium or thorium after the crystal was formed. They use the ratio of lead to uranium in the zircon to date the crystal. This is how the age of the zircon crystals from the Jack Hills in Western Australia was determined. Studies of the Jack Hill zircons have also produced information relevant to the evolution of life on Earth. The ancient crystals produced a distinctive isotopic signature when the relative ratios of oxygen-18 and oxygen-16 were examined. According to researchers, the results indicate that the crystals interacted with water on or near the Earth’s surface. If there was liquid water on Earth as early as 4.3 billion years ago, then life may have existed on the planet much earlier than previously believed. This new evidence could push the origin of life on Earth back some 400 million years. In addition to revealing new information on the evolution of Earth, zircon may also give us insight on the age of the moon. Our closest neighbor is generally believed to have formed from a collision between our proto-planet and a large Mars-sized body sometime after the origin of the solar system. Some researchers have argued for an older, and some for a younger moon. 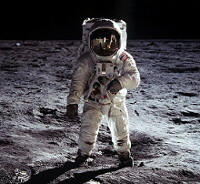 A recent study of zircon samples brought back from the moon by the Apollo astronauts in 1972 has shed new light on the age of the lunar surface. Using the radiometric-dating techniques on lunar zircon, scientists now postulate that the liquid-magma ocean on the surface of the moon coalesced about 4.51 billion years ago.